I wanted to thank you for this post. We’ve been manually converting our folder structure outlines into actual folder structures, as each is as unique as the project requirements. With the information in this post, we can edit the folder structure up to an hour before going live thanks to this! Great work, as far as I understand. I am very interested in your script Create folders I and II to complete not a very complex hierarchy of folders from a list, but almost 300 lines (this is for a folder of a list of education training). I’m using this to create set of folder to create an organised applications folder in the dock. I have over four hundred folders need to create and your script provide the foundation for me to create folders from a csv file. I managed to use mulitple myCSVfile to get what I exactly want. Thank you so much and you save me hours! Glad you were able to find something useful here. Could you use this to set the permissions (for the username to be the same as the top folder name) using the ‘owner’ and ‘owner permissions’ settings? I’m strungling to make this work within apple script editor (your code works brilliantly for what we want) and thinking that i might need to make another script to set this. Many thanks for the confirmation/pointers on this. Oh yeah, that’s a great question George. I can’t remember doing anything with permissions before, but I’d be interested to look into it. Unfortunately I’m flat out for the next couple of days. I’ll get back to you as soon as I get a chance to give it a go. Hey! This is very useful. Thanks a lot. I have one more question. How do i input in the script to choose the destination folder for the folders to be created in? 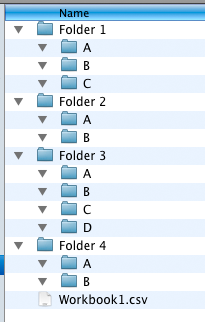 By default the script creates the folders in the same location as the csv file. hey- this is awesome! any way to limit folder creation to a single column on the csv? i’m working from csv files with multiple columns of info and need to make folders from numbers is column A. If you just want Column A, then you don’t need all items of each paragraph, only item 1. I haven’t tested this in the context of the rest of that particular script. I’d actually write the script differently for this functionality — but it may work with the simple line change. See how you go and let us know. that seems to work just fine. thanks!! I just found this page because I’m trying to do the opposite. Do you have an applescript that can look at a directory structure and output a CSV? Sorry I can’t figure it out on my own, I’m not an Applescript guru. I haven’t done one yet but I’m happy to have a crack at it. 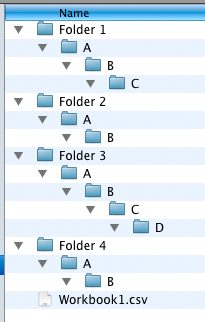 Send through a small example of a folder structure and how you’re hoping the resulting csv will look. I’ll be able to have a look at in when I get back in a couple of days. AHH I love this post!! this for the reply!!! I will most def be using these scripts!! !